Hello everyone! This is Cassandra from Creating with Color by Cassandra. 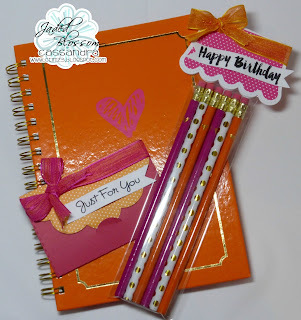 And today I have a bright and cheery Birthday Gift Set for our very own Miss Candace! I got this cute little journal and matching pencils at Michaels. Aren't they fun?!? I put the pencils in a 2.5 x 8 inch clear bag. To decorate it, I used the Jaded Blossom ~ Scallop Slider & Topper Dies. For the banner, I used the Jaded Blossom ~ Flag Dies 2. And the "Happy Birthday" sentiment is from the Jaded Blossom ~ So Many Birthdays 2. Then, I wrapped up a fun little gift card using the Jaded Blossom ~ Folding Gift Card Die. Once again, I used the Jaded Blossom ~ Flag Dies 2 for the banner. And the "Just For You" sentiment is from the Jaded Blossom ~ For the Hostess. Well my creative friends, that's it for me today. 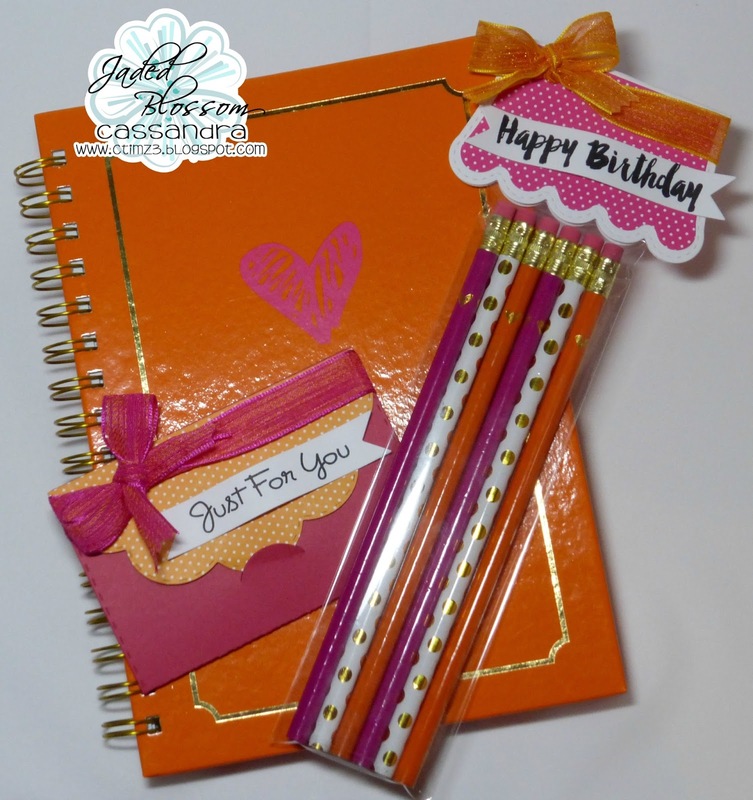 I hope you enjoyed my fun little Birthday Gift Set. I will see you all again soon. Have a great day everyone!